When results for the best red wine category were announced at the India Wine Challenge in January, it was a surprise to see a golden Nero d’Avola from an obscure Sicilian winery bag the coveted prize. But a recent trip to their vineyards by Subhash Arora explained how Gulfi makes excellent wines as also another premier winery, Principi di Butera he visited en-route. If Gulfi had an importer in India, he would have been bragging to the potential buyers about the 90+ points awarded by Robert Parker to all four of their Cru wines made from Nero d’Avola- Neromaccarj, Nerosanloré, Nerobaronj and Nerobufaleffj the last of which also managed a medal at the Challenge, albeit a Bronze. To those familiar with the Italian Gambero Rosso, the importer would also boast about the coveted tre bichhieri for the Nerobufaleffj and also chip in for San Lorenzo Cru 2006 (Nerosanloré) had won ‘five bottles’ (highest rating) by L’espresso, another creditable wine guide. Of course, the more modestly priced and affordable Nero d’Avola, Il Nerojbleo, the Best Red Wine of the Challenge would have been the first to be on the list of the discerning restaurants specializing in Italian cuisine and fine wines. I had been also fascinated that Le Guide de L’espresso in its ‘I Vini d’Italia’ 2010 edition had given 2-star rating (No Sicilian winery managed the highest 3-stars) to only five wineries. Gulfi was one of them-the other being Benanti, Florio, Planeta and Tasca d’Almerita. Therefore, I decided to visit this winery even though it would mean an extra day or two and over 500 kms of detour after the end of the Sicilian Ante Prima Tastings this month. The choice made, it wasn’t difficult for Franco Zuffellato, the Director Communications for International Business for Veneto- based Zonin, who had especially come for the Tasting from the Zonin headquarters in Gambellara, to convince me to visit their premier Sicilian winery – Feudo Principi di Butera on the way to Gulfi as it was midway, generally in their direction. If the €100 million Zonin wine empire was earlier known for high volume, industrial wines in the seventies and eighties, Gianni Zonin, the enologist patriarch is also acknowledged as having moved towards quality wines by buying new premium wineries which he has been setting up during the last three decades. Sleeping in the comfortable, quiet guest house that night, my thoughts turned to the remote possibility of my retiring some day, taking sanyas (renouncing worldly possessions and turning spiritual) and going to the Himalayas. Principi di Butera estate might be a better, nicer, quieter and a vinuous location with a wide expanse of vines. My most immediate thoughts were however, focused on the remote possibility of a heart attack, in which case I’d hope the good Lord and a couple of glasses of red wine might be my saviour. The 300 hA estate is well located, away from civilization in the countryside with rolling hills around 3-400 meters high. Seemingly located well in the interiors, about 40 minutes drive from Caltanissetta; the vineyards are barely 8 crow-kms away from the Mediterranean and have a maritime climate with hot mornings, windy afternoons and cool nights. The 180 hA planted vines give about 900,000 bottles a year although the stainless steel tank capacity is 25 million liters, keeping in view the future expansion, explains the winemaker and Direttore Antonio Cufari, . 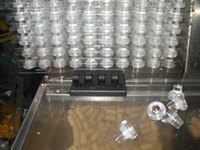 The winery is very modern- from the crushing equipment to the tanks, the cellar and the automatic bottling plant. First thing that struck me while tasting wines after an extensive visit to the vineyards and the winery was the presence of two labels of Surya (which means Sun in Hindi). Surya IGT Insolia- Chardonnay blend and the Nero d’Avola -Merlot red, both label names were borrowed from India where the Zonin wines have been exported for several years, first through Brindco and now through Aspri Spirits. Both make excellent value for money options. All four varietals were also part of the portfolio I tasted. But the star performer of the winery is – yes, the signature red grape of Sicily, Nero d’Avola. Riesi is a DOC wine with 90% Nero d’Avola. Deliella 2006 is a 100% single vineyard wine from vineyards of the same name, which despite the expensive price tag, is a delicious, concentrated wine with the Mediterranean touch. Plump and juicy wine, it had a great mouthfeel and a persistent after taste. One can drink it now with food although it will age and get better during the next 4-5 years. 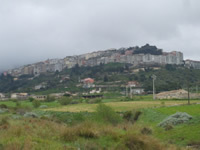 Approaching the city of Chiaramonte Gulfi from Catania or Gela/ Ragusa, one is reminded of the beautiful city of Orvieto in Umbria- perched on top of a mountain top. The Gulfi winery is about 4 kms from the city and one of the first and last impressions the visit leaves is the beautiful and different views of the city from the winery. 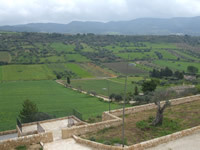 ‘The winery has an interesting but familiar Sicilian story. My grandfather who was from this city went to Paris for better prospects and settled there. My father decided to come back to Italy where he settled in Milan because of better business prospects,’ says Matteo Catania, son of Vito Catania, who had come especially from Milan to meet me. ‘Our core business is making chemicals including cleaning agents used for cleaning the Ferrari engines at Formula 1.’ The business is obviously prosperous because they have invested their own money for the whole project started in 1995. But why were the names so strange and foreign sounding, I ask? ‘It is very simple actually. They all represent the names of the vineyards, district in which the hills are present. It is not possible according to the local laws to get a brand registered in their names, so we simply changed the ‘i’ to a ‘j’ in their spellings,’ said Matteo. So Nerobufaleffj simply means the Cru red Nero d’Avola red wine from the single vineyard in the Bufaleffi district. The Golden Gulfi Nerojbleo is the red wine from Nero d’Avola from Ibleo hills- in this case 80% of their grapes come from the province of Ragusa and 20% are from Pachino, in the municipality of Noto- a small town noted for its terroir. 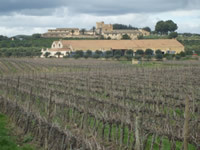 The vineyards are spread over different parcels within a radius of around 60 kms, in Pachino, Etna and Noto. Farming is completely biological and the soil makes it possible for them not to irrigate the vines at all. It is a beautiful surprise to enter their charming guest house-Locanda Gulfi. The 7-room complex with each room named after the contrada (district) in which the vineyard is located, is very modern with tasteful interiors and a 24/7 complimentary Wi-Fi internet facility. The restaurant- actually two of them on different floors, offers the best view one might have enjoyed over breakfast, in a long time. Facing the vineyards on one side, there is a big glass door on the other side through which you can view the winery at the lower level. One can also walk out of the door and inspect the winery in operation! 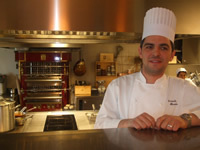 On the other side of the winery there is an open kitchen where Chef Carmelo Floridia whom the Catanias hired from the Four Seasons Hotel in Milan shows you his culinary and presentation skills- if Michelin inspectors went into the restaurant they would be tempted to star it! The view from any which way you look is almost breathtaking- starting with the town of Chiramonte Gulfi, a few kilometers away and the rolling vineyards wherever your eyes follow- and of course olives and fruit trees. But the wines Gulfi makes and I tasted with food were all very delicious-even the ‘non- cru’ wines. In fact the Nerojbleo, the IWC Top Wine should be well within the reach of most. Full of fruit and a crisp acidity, the wine is well structured yet drinkable now with or even without food. The best of the lot for me was a Cerasuolo di Vittoria 2008, the mandatory blend of Nero d’Avola and Frappato red grapes, 50-50 in this case, which was so fresh, crisp and full of cherry, blackcurrants and plums with a long and crispy end that made me want more before finishing the sip. I could have drank all night! And still have asked for more!! 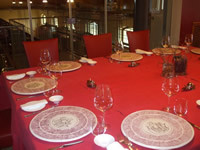 Participating in Ante Prima and inviting a group of journalists to visit the winery would be a big booster for the Golden Gulfi- wine, Locanda et al. Cusumano used to export wines to India a few years ago-mostly low ended and some medium ended, through S V Distributors, Mumbai. Then one stopped hearing about either. Once, I saw a pile of their wines at Olive Beach Restaurant, way beyond a balanced inventory would suggest and then every thing went quiet- dead quiet. 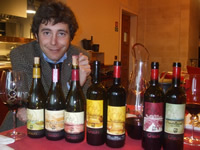 Therefore, when I met Alberto Cusumano at the recent tasting, not only did I taste the complete range of their wines- Angimbè 2009, Cubìa 2008, Jalè 2008- all whites made from Insolia and Chardonnay; Pinot Nero 2007, Benuara 2008, Ságana 2007, Noa 2007- all made from different red grapes, 7 of the 13 wines they produce in all.. They are located near the airport (barely 10 minutes- I was told). So I planned to make a flying visit on my way to the Palermo airport after driving there and a half hours from the Gulfi winery in Chiaramonte Gulfi. I was reminded of the Indian Standard Time when 20 minutes past the airport, there was no sight of Cusumano. Suddenly, we were greeted by multiple huge tanks reminiscent of petroleum refineries and knew we had finally arrived. The time being short, one could not dream of tasting. But a quick tour of the winery with Alberto Cusumano was enough to understand that they used to be in bulk wine business till a decade ago. 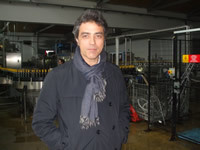 The father added the new business of selling the bottled wine for their sons in 2001 and today they sell 3 million bottles, increasing their holdings from 80 hA in 2000 to 400 hA today. Jogging through the rather modern winery, I noticed they were bottling for a UK importer a special Cusumano label, making them a good source for importers who may be able to get a special label for private retail stores, if the volumes are large. A plethora of awards they have won during the last few years for their Ságana ( no surprise-yet another Nero d’Avola! 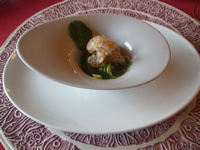 ), Noá, Angimbè Benuara and even Jalè, suggest that they are fast becoming a Sicilian brand to reckon with. And thanks to a quick ride with Alberto, I did make the trip to the airport just in time to catch the flights to Rome and home., already feeling ‘yeh dil mange more’ and promising myself to visit a few more wineries during my visit to Palermo in April as an international judge at the Concours Mondial Bruxelles. Dear Mr Arora, It is a plesure to read you. Giusi Macchiarella ( Assovini remember ?? ?